MARSHFIELD, WIS., Nov. 1, 2010 – To address the need for metal detectable supplies in food plants, Nelson-Jameson has brought together a wide line of processing tools and protective apparel that can be easily detected. Of those products, Nelson-Jameson is proud to announce that they are now the only U.S. distributor to the food industry of Detectaglove™ metal detectable disposable gloves. 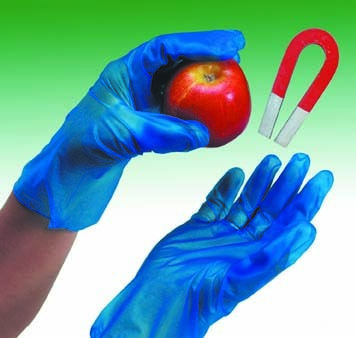 The highly-visible blue color of the gloves can be detected as a whole or if pieces fall into product in the electromagnetic range of 50 Khz – 1 Mhz. 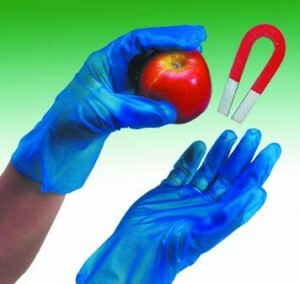 Compliant with FDA 21 CFR for food handling, these vinyl gloves are powder-free and sold by the box of 100. For more information, contact Carol Blakey, Safety Product Manager at 800-826-8302. Nelson-Jameson, Inc. has been an integrated supplier for the food industry since 1947. Product lines include safety & personnel, production & material handling, sanitation & janitorial, processing & flow control, laboratory & QA/QC, and bulk packaging & ingredients. The company is headquartered in Marshfield, Wisconsin, with other locations in Turlock, California, Twin Falls, Idaho, and York, Pennsylvania. For more information visit, www.nelsonjameson.com. This entry was posted in Press Room. Bookmark the permalink. Follow any comments here with the RSS feed for this post. Post a comment or leave a trackback: Trackback URL. We are looking for metal detectable gel pens. What do you have? Thanks for the question, Brandon. We will actually have this product shortly, should be in stock in about a month. It will be a blue pen with black gel ink – stock #364-2958. For more information, call 800-826-8302. Thanks again!